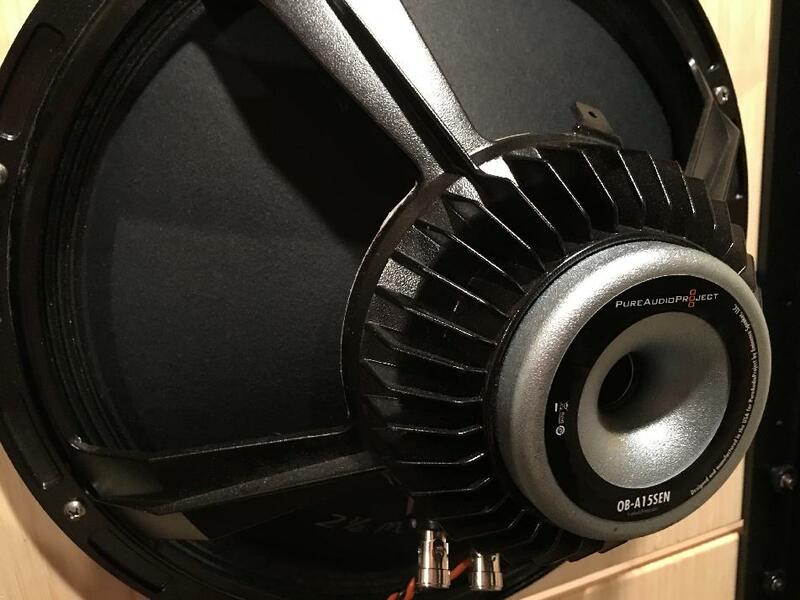 PureAudioProject is the brainchild of Israeli Ze'ev Schlick and the idea is to take advantage of the simplicity of open baffle speakers combined with easy DIY assembly and direct buying from suppliers to provide a serious high end speaker at a relatively affordable price. There are two affordable concepts in the PureAudioProject range - these being the Trio 15 reviewed here and the Trio 10. The major difference in the base concept is the size of Bass driver - the Trio 15 uses 15 inch drivers and the Trio 10 uses (logically) 10 inch drivers. As it's the 15 we're concerned with here I'll list a few of the options which you can combine together depending on your tastes and budget. There are two different frames to hang the baffles from (steel/wood and aluminium). Two types of bass driver both made by Eminence specifically for PureAudioProject are available - these can be selected depending on the Mid/HF driver you are going to run. For the top end there is the Tang Band Full range driver tested here but you can also run Beyma or Heil AMT units and there's a new field coil based unit that has just been announced. Crossovers are available for all versions or you can go active and drive the speakers that way. To hold everything in place baffles are made from either oak, bamboo, piano laquered wood or you can make your own with the drawings supplied. I've not calculated the total variations possible but I'm pretty sure there's a combination to suit most peoples tastes and requirements. They are are more high tech construction than the other available driver with a cast aluminium frame rather than pressed steel and a bigger magnet assembly. They are required for the Beyma and Heil AMT versions as they are just that bit quicker sounding. Ze'ev suggested I go for this version as I run a Push Pull valve amp. The standard version is better suited to SET amps and is slightly "softer" sounding. These are used throughout the Pure Audio range these are the cheapest unit on the options list but are equipped with serious magnets as I found out whenever I got anywhere near them with steel tools. A paper cone is combined with an aluminium phase plug. RealOak baffles (to go with my interior during the review period) were also chosen along with the latest spec Aluminium frames for rigidity. These are the genuine article and are not veneered MDF or chipboard. Latest spec crossover fresh from Mundorf - these run the drivers in a 2 way configuration. High quality jumpers allow treble level to be adjusted to 3 levels and there are 2 sets of binding posts for bi amping or bi-wiring. Ze'ev arranged for me to get the bass drivers in advance as they take around 200 hours to run in. As 200 hours represents a lot of listening time for those of us who work eleswhere for a living I hooked all four of them up to a transisitor amp (old skool Mission Cyrus One) in the garage and left them running with a Sergent Garcia CD for 8 days non stop to ensure they weren't going to cause any surprises once the rest of the componenets turned up. And turn up they did in various boxes from various locations. The crossovers came from Germany as did the baffles and TB and Eminence drivers. The aluminium frames on the other hand are made in the US and were flown in from there. Once all the components had arrived I could get building. This is very easy using the supplied instructions and if you can manage Swedish flat pack furniture you should have no issues putting the Trio 15 together. I would suggest assistance from someone for some of the stages as the combination of driver on baffle is quite heavy and holding them in place while fixing the baffles to the frame is a bit nerve racking if you try this on your own! Wiring is easy - you will need a set of wire strippers if you have the Neo drivers as the crossovers come with (high quality) wires with push connectors which don't fit the Neo's. Obviously if the speakers were my own I'd probably solder some connections wherever possible. As a final point the Trios are supplied either with normal spikes or Soundcare Superspikes depending on your floor requirements - a nice touch and one many manufacturers could follow. I mostly ran the Trios with my usual Canary 608LV amp and Hitachi LC-OFC cabling. Sources varied between a Linn Axis/AO Linn Akito/Ortofon 2M Black or Reson Etile or Audio Note IQ3, an Iphone 4 and a Naim CD5i. However once they'd been run in and the build was finished in the basement I couldn't resist a quick run with a Sony CD Walkman and my Cyrus 1 that had been doing the running in duties. Into the player went Orbital's Brown album and I went straight to track 3 "Lush 3-1". First impressions were pretty gobsmacking bearing in mind I was running a sub 100€ source and had spent absolutely no time correctly placing anything! There was speed, a lot of scale, detail and a big grin on my face which is always a good sign. My elder son came downstairs and thought that these speakers that are as tall as he is were definitely a good idea and could he get AC/DC out? We avoided AC/DC for the time being and once one of my neighbours had come round to help with the lifting the Trios were duly installed in the living room. Before we go any further we going to come onto what is really the only issue that I have with the Trio 15s (which I appreciate gives the rest of the review away a bit but this bit fits best in here) - they are a bit on the large side and tend to visually dominant the space they're in. Now I knew this before I asked Ze'ev for them but it's like when you see a TV in the store and then get it back home - it always looks bigger in your lounge! In reality they don't take up any more real estate than any other full range speaker but visually they appear to, although you definitely do get used to them. When my Dad came round his initial reaction was "What the hell are those?" but this had changed after a day or two's casual listening into "I could definitely get used to these". So I think it's safe to say they eventually blend into their surroundings and until they do they may well be a talking point amongst visitors. Due to their physical size you'd expect scale and depth from the sound and that's what you get. What I didn't expect was the delicacy that they are also capable of. Something similar like that old show favourite Norah Jones "Feels like home" is given a level of subtlety that I'd never heard before. It's as if the difference between quiet and loud is more pronounced. Players suddenly have the ability to get across the subtleties in their playing, the micro dynamics and inflections in the way they play or sing. I guess that could be summed up by the word emotion. This delicacy was also evident on Sting's "The lazarus Heart". Straight away the opening percussion and guitar is not being thrust at you but is portrayed as a quiet and subtle but detailed opening. Only when Manu Katché comes in with the drums does the track really kick off. Add to this a gorgeous tone on the soprano saxophone which has presence, body and sweetness and I track I've played maybe 100 times becomes as fresh as a daisy. Coming from the Project Speaker Box 5s that I'd been listening to before, the presentation is unsurprisingly vastly different. The Projects major on precise imaging and don't attempt to bring scale to the music. The Trios look at things from a different perspective and major on realistic sizes to instruments and performers. The imaging is not as precise as from a monitor type speaker but the whole soundstage is wide and deep and gives a feeling like you're there. This was immediately obvious on Haiatus Kaiyote's "Choose your Weapon". The opening track sounds abolutely massive but at the sime time managing to ensure instruments are clearly presented and sound real - we're not talking PA stack massive. The Trios timed what is quite complex music superbly making me want to at least try and follow the drummer with my foot tapping and revel in some superb playing. This (new to me) record also highlighted another strength on the Trio 15 - they allow you to easily get into music you are unfamiliar with. This is something which better systems pull off with ease and the Trios don't disappoint in this area. As an example, during the time I had the Trios a potential customer of Ze'ev's popped round for a demo. He brought a selection of CDs including some modern classical pieces. Now I'll be the first to admit I know little about modern classical stuff but the Trios made unfamiliar material a pleasure to listen to and I regret not having noted some of the pieces we listened to to investigate further. I do nevertheless think improving Celine Dion is probably beyond even them and their powers. 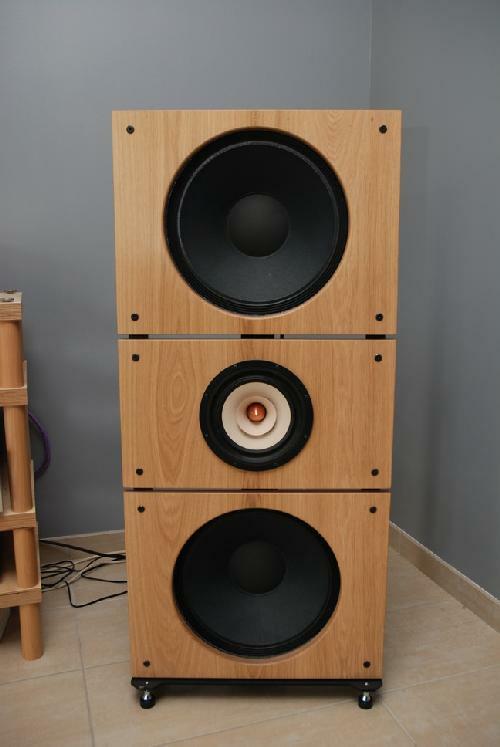 While we on the subject of power these speakers are highly efficient at around 95dB but they do need to be turned up a bit for the bass to really swing. This would seem a strange remark with 4 15 inch drivers pointing at the listener but they're not in boxes so a lot of sound is going back towards the wall in the same way as with any panel speaker. Now this isn't necessarily a bad thing - the lack of boxiness is a pleasant surprise and allows the character in bass instruments to shine. There are also no obvious resonances - something shown by Björk's Hyper Ballad where on my personal Linn speakers one of the bass notes is louder than the others and one almost drops out. This doesn't happen on the Trios - if it's there they'll play it at the right level without exageration or boom. A try of Talvin Singh's "Vikram the Vampire" off of the album "OK" shows off all these characteristics. Deep but clean bass allowing you to easily follow the track - there's no muddiness or exagerated weight which just kills speed. They also show you exactly what's being played which can be a surprise when you find a bass note actually isn't there and that you'd sort of mentally filled in when listening to the same tack on lesser speakers. The Talvin Singh track is also a great treble tester - on a speaker that is on the lean side the volume needs to be turned up to hear all the bass rumbles and thuds which invariably results in a treble level capable of annoying dogs in a 2 mile radius. Now whilst I'm not a fan of dogs and irritating a large proportion of the local canine population is to me time well spent, the resulting presentation can grate on human ears as well. The Trios avoid this keeping a good balance throughout the frequency range. Now if you're turning the track up it's to enjoy the energy and resulting emotion they can produce. I think you've probably gathered that I like the Trio15TB NEO a lot. It could be said that 3500€ is a lot of money for the average hifi enthusiast especially for a product you have to assemble yourself. However this same self assembly means you're getting some very serious product for your money. I don't know the margins involved in direct selling but I'm willing to bet that if you bought these in shop ready assembled you'd be talking at least 5k and possibly 6. Cast in that light this is a very serious speaker. They do scale, bass, imaging and are more than happy to boogie when required. Add to this subtlety, delicacy and a decent sized helping of emotion and I can't see many people being disappointed. Would I recommend them to anyone? Subject to having a suitable size room I'd definitely say yes. 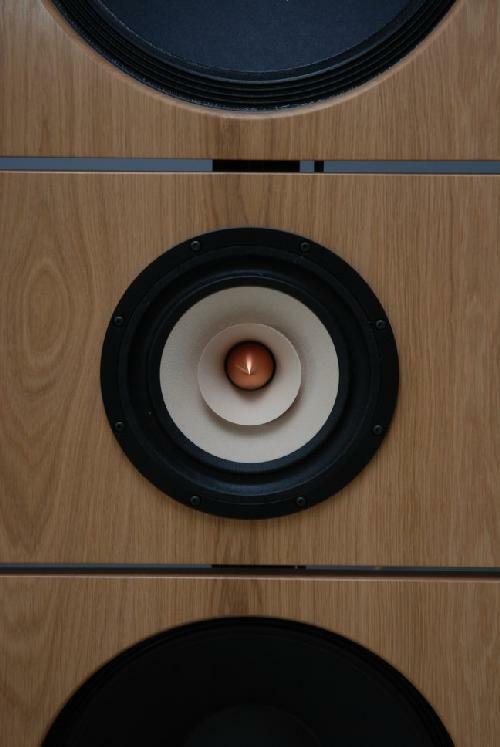 Those with smaller houses (ie most UK residents) may wish to look at the smaller model but the big model makes a compelling case for itself so ignore domestic harmony and WAF and just enjoy some great sounding speakers.